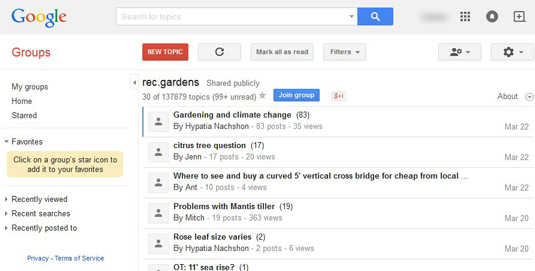 You can find discussion groups — either Google groups or Usenet groups — on just about every topic, which enables you to communicate with people with like interests all around the world. Some groups are open, which means you can join without anyone’s approval. Other groups are restricted or private, which means you have to apply for membership and be approved by the group’s owner. In the list of groups, click on the group you want to join. You see the list of messages (see Figure 1). Click the Join Group button at the top of the group. You see the Join Group dialogue box. If you want to change your display name (that is, how you appear to that group), click Edit next to your name. If you want to link to your Google profile and show your photo, click the check box. Note: If you enable this, everyone will be able to view your shared information in your Google profile. Next to Email Delivery Preference, choose how you want to receive e-mail updates of group activity. The default is not receiving updates via e-mail. If you want e-mail updates when you post to the topic, check the appropriate box. You now have access to the group; you can read and post freely to the group. Figure 1: Join a group. Open discussion groups are susceptible to spamming, and some of the spam may be adult oriented. Hopefully, the group moderators can keep up with deleting spam, but you will likely encounter spam posts that may be offensive. Click into the group you want to join. For a restricted group, click the Apply to Join Group button at the top. You see the Join Group dialogue box. Follow Steps 3 through 6 above to fill in the information in the Join Group dialog box, and then click Apply to Join This Group. For private groups, click either the Apply for Membership link or the Contact the Owner link. In either case, you need to explain why you want to join the group. When you apply to join a restricted or private group, it’s entirely up to the owner on whether you’re allowed in the group. You’ll need to make a good case for joining and prove you’re not someone who’s going to spam the group, since that’s one of the main reasons group owners restrict their groups.